Daniel Maslowski was born in 1949 in Chicago, Illinois. He entered the U.S. Army on January 20, 1969, and then attended the Warrant Officer Candidate Rotary Wing Aviator course, earning his appointment as a Warrant Officer in the Army and his Army Aviator Wings on February 23, 1970. His first assignment was as a UH-1 Iroquois helicopter pilot with Company B, 229th Aviation Battalion of the 1st Cavalry Division in South Vietnam from March 1970 until his helicopter was shot down over Cambodia and he was taken as a Prisoner of War on May 2, 1970. After spending 1,018 days in captivity, CWO2 Maslowski was released during Operation Homecoming on February 12, 1973. He was briefly hospitalized to recover from his injuries at Fitzsimons Army Medical Center in Denver, Colorado, and then attended UH-1 refresher training and OH-58 Kiowa training at Fort Rucker, Alabama, from August to December 1973. His next assignment was with Headquarters Battalion, 25th Infantry Division Artillery of the 25th Infantry Division at Schofield Barracks, Hawaii, from January to August 1974, and during this time he received a direct commission to Captain on June 5, 1974. Capt Maslowski served as Assistant Operations Officer and as a Section Leader with the 118th Aviation Company of the 25th Infantry Division at Schofield Barracks from August 1974 to July 1975, and then as Commandant of the Nap-of-the-Earth (NOE) School with the 25th Aviation Battalion of the 25th Infantry Division at Schofield Barracks from July 1975 to March 1976. His next assignment was as a Platoon Leader with the 347th Transportation Company of the 25th Infantry Division at Schofield Barracks from March 1976 to November 1977. Capt Maslowski received a college assignment to complete his bachelor's degree at Chaminade University of Honolulu from November 1977 to May 1978, and he then attended the Transportation Officer Advanced Course and the Aircraft Maintenance Officer Course at Fort Eustis, Virginia, from June 1978 to April 1979. His next assignment was as an instructor with the 1st Staff and Facilities Company at Fort Eustis from June 1979 to August 1980, followed by service as Company Commander of the 2nd Staff and Facilities Company at Fort Eustis from August 1980 to July 1981. Maj Maslowski attended Armed Forces Staff College in Norfolk, Virginia, from August 1981 to January 1982, and then served as Chief of Passenger Traffic for the entire Army in the Continental United States (CONUS) with the U.S. Army Military Traffic Management Command in Washington, D.C., from January 1982 to December 1984. Maj Maslowski served as Executive Officer of the 2nd Aviation Battalion of the 2nd Infantry Division in South Korea from December 1984 to December 1985, and then served as a Division Chief with the Soldier Support Center in Alexandria, Virginia, from January 1986 to January 1987. 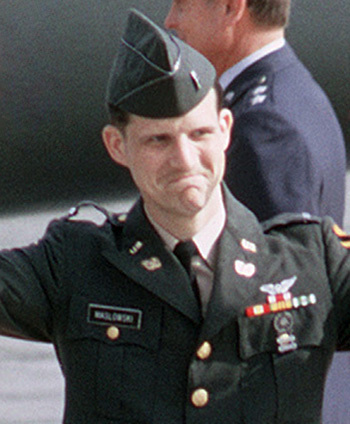 LTC Maslowski's next assignment was in the Department of Defense POW/MIA Affairs office in the Pentagon from January to September 1987, followed by service in the Army POW/MIA Office in Alexandria, Virginia, from September 1987 until he was medically retired from the Army on October 1, 1989. For gallantry in action: Chief Warrant Officer Daniel F. Maslowski is awarded the Silver Star for heroism involving voluntary risk of life while serving as a Prisoner of War during April 1972 and September 1972. Chief Warrant Officer Maslowski was one of a contingent of American prisoners who was held captive by the Viet Cong in Cambodia that were being moved from one prisoner of war camp to another prisoner of war camp. During the long and arduous ten-day forced march, he consistently aided other members of the group of prisoners of war. When one individual was having difficulty with his pack and was overly fatigued, he took it upon himself to carry the other individual's pack while giving encouragement for him to continue the march. Later during the march, Specialist Five Crowson was having extreme difficulty in keeping up with the group. He was suffering from malaria and had not been able to properly eat for several days. Therefore, his physical condition was extremely poor and he finally fell to the ground. His captors started dragging, prodding, and kicking him. Later they placed him on a bicycle, facing backwards, with legs straddling the support bar. Both hands and feet were tied so tight that circulation was cut off. To prevent recurrence of this, Chief Warrant Officer Maslowski persuaded the interpreter into letting him help Specialist Five Crowson. Even with the help of Chief Warrant Officer Maslowski, he was unable to continue for more than a few hours, and although both tried desperately, Specialist Five Crowson finally collapsed. When the guards stated to threaten, prod and kick Specialist Five Crowson again, Chief Warrant Officer Maslowski became enraged, removed his pack and with complete disregard for his own safety, slung his pack into the stomach of one guard and pushed another aside and at the same time condemned them for their actions. Then without hesitation, he reached down and placed Specialist Five Crowson on his back in a piggy back fashion and carried him nearly one full mile over rough terrain. Upon reaching a place to rest, Chief Warrant Officer Maslowski placed Specialist Five Crowson on the ground and fell to the ground himself in complete exhaustion. When it was discovered that Specialist Five Crowson's pulse could not be found, Chief Warrant Officer Maslowski immediately started giving him heart massage and other life saving measures for about an hour before Specialist Five Crowson responded. During August and September 1972, Captain Young was extremely ill and it was evident that he would die shortly if he did not receive medical treatment. Chief Warrant Officer Maslowski continually demanded that the enemy give Captain Young a special diet and medicine but to no avail. For this, Chief Warrant Officer Maslowski was intimidated, humiliated, and threatened, but he never gave up. About three days before Captain Young died, he was moved to a make shift shelter outside. On 17 September 1972 Chief Warrant Officer Maslowski and Chief Warrant Officer Hestand were released from their chains to serve food to the other prisoners. Shortly after they started the detail, Captain Young asked to be covered because he was cold and CHief Warrant Officer Maslowski covered him and gave him words of encouragement. Within a few minutes after this Captain Young lurched suddenly and his body became rigid and then he relaxed, gasping for air. Immediately they rushed over to Captain Young, and finding no heart beat, Chief Warrant Officer Maslowski immediately started mouth-to-mouth resuscitation while Chief Warrant Officer Hestand started a heart massage. The medic and doctor were summoned by the guard and shortly after the doctor arrived, Captain Young died. Chief Warrant Officer Maslowski and Chief Warrant Officer Hestand continued to administer life saving steps for approximately an hour before they gave up. Then Chief Warrant Officer Maslowski and Chief Warrant Officer Hestand were returned to their bunker. As Chief Warrant Officer Maslowski started to enter his bunker, he turned and condemned the doctor and interpreter for letting Captain Young die. The next day, he was called before the Viet Cong camp commander and political officer and was told if he did not change his thinking and attitude he would not be released. Chief Warrant Officer Maslowski told them they might be able to force him to say anything but they would never be able to change his thoughts. All of these actions were taken amidst numerous threats of bodily harm by enemy guards. By his completely unselfish acts in the face of personal body harm, Chief Warrant Officer Maslowski reflected great credit upon himself, the United States Army, and the American prisoners of war. 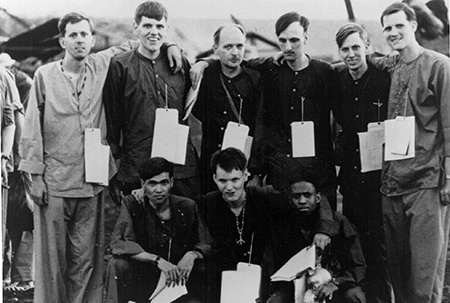 9 of the 27 American POWs held in Cambodia by the Provisional Revolutionary Government of South Vietnam (PRG), and then released at Loc Ninh, South Vietnam, on 12 February 1973. Top row, left to right - Frederick Crowson, Gary Guggenberger, Raymond Schrump, John Dunn, James Hestand, Daniel Maslowski. Bottom row, left to right - Felix Neco-Quinones, Richard Springman, Bobby Johnson.